It was a quiet enough week on Twitter with most talking about the first ever Epic Poker League main event, which was won by Chino Rheem. A lot of players were congratulating the finalists, especially Jason Mercier who finished in third place, and the overall champ, Rheem. There was a lot of talk surrounding Rheem’s win however due to his previous debts to other players, and this transferred across to Twitter where Rheem stood his ground with some support. That same day Rheem tweeted, “Ya, I won a million bucks! And I’m still broke! But I feel better than ever! Anyone Who’ wants to judge me, y’all better know me first!” And, "I’m living my life! Broke or pumped! Ima do me! I know Who’ my friends are, I’m grateful for y’all! I love y’all! I’ll die for my team! Rheem has yet to Tweet about this. Check back next week to find out the latest poker happenings on Twitter in Europe and abroad. 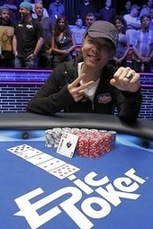 Tags: Chino Rheem, Epic Poker League, Poker Debts, Huck Seed, Jason Mercier, Probation.